Is that you Norman? You better believe it. Anthony Perkins reprises his iconic role as creepy innkeeper Noman Bates in the long-after sequel to the Hitch original. 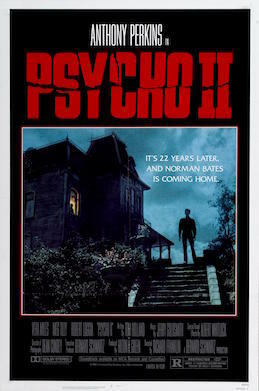 On today’s episode, Psycho II. Does it live up to the lofty standard set in the 60s? Let’s peer behind the shower curtain to see what lurks…as Norman is released from prison to attempt to resume some semblance of a normal life.